We first came across this producer when we tasted the Domaine Gouffier Aligoté a couple of years ago. It knocked us for six. It was about as far removed from your customary tart and bitter aligoté as was possible. 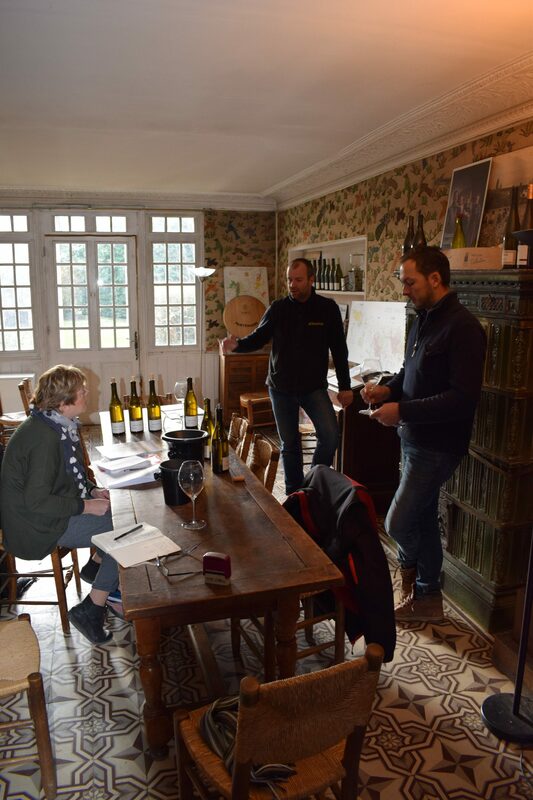 So how good to finally visit Frédéric (Fred) Gueugneau and Benoît Pagot at their farmhouse on Fontaine’s Grand Rue, southwest of Rully. Set behind a gravel courtyard, their 19th century farmhouse is filled with a beguiling collection of peeling French farmhouse furnishings, quirky wallpaper, crumbling pargetting, and odd-looking objets d’art, its faded glory complemented by modern low-slung couches, a widescreen TV and a monstrous sound system complete with mixer. You’d pay some fancy interior designer a fortune to come up with such shabby chic. The farmhouse acts as a base for the pickers during harvest, and you get the impression that for the joyeux vendangeurs, it must be one long acid house. The Aligoté En Rateaux which excited us has now moved on to the 2017. 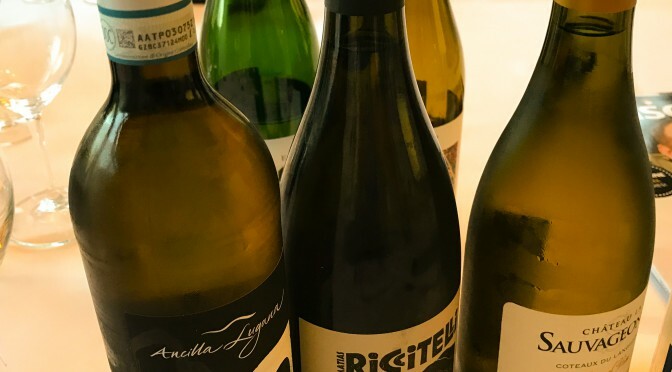 While not having the knockout punch of its older brother, it has a vivacious flower and citrus feel to it and simply fills the mouth with flavours and piercing acidity. The Bouzeron Les Corcelles 2017 reminded me of some our Greek wines, with its volcanic feel and saline quality. A huge mouthful. The Rully Premier Cru Rabource 2017 has an inviting and open nose of elderflower and apricot. An amazing wine. 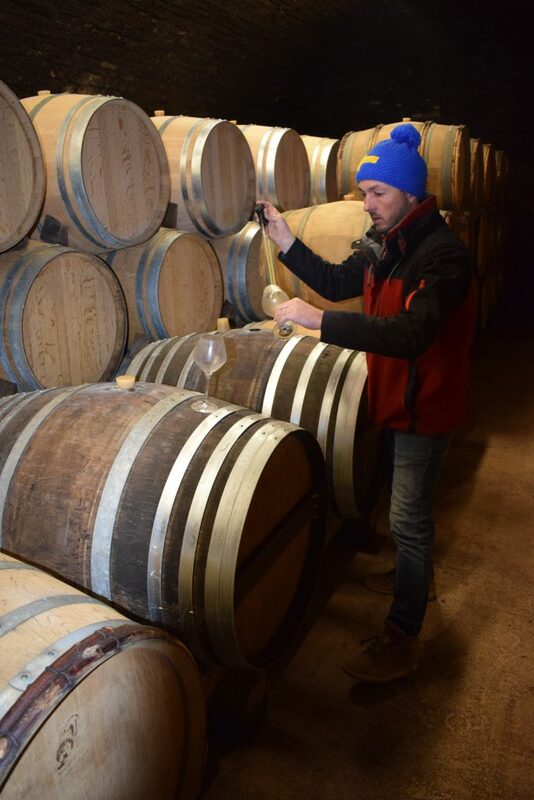 We finish with the red Mercurey La Charmée 2017 which lives up to its name with real purity of fruit – blackcurrants, this time – and beautifully integrated oak. The tasting has been one stunner after another. 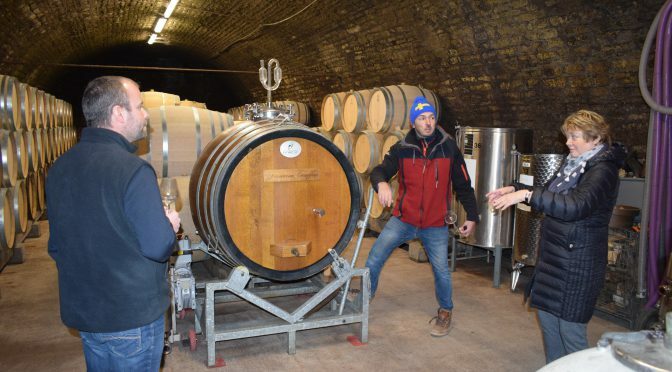 Fred and Benoit, now in hoodies and trainers, take us outside to the rustic winery and proudly show off a barrel room housed in a stone-domed cellar which served as a bunker for Napoleon’s army. Once more, as with so many of our new producers, what we have here is a mixture of reverence for what they have inherited along with a determination to make their own mark on Burgundy’s history. This place is in good hands.